When the world gets to be too much, the only thing for a weary soul to do is check into the nearest Scandinavian furniture store and go crazy in that little room with all the coloured balls. I'm sure that's what Melbourne indie band, Architecture in Helsinki, does. Their new release, "In Case We Die" is a technicolor ode to joy that packs as much bounce as a rubber trampoline. AiH is a multi-instrumental collective similar to current chamber-pop stars, The Arcade Fire and choral enthusiasts, The Polyphonic Spree. These bands seem to gain or lose individual members depending on the demands of a song and bear more likeness to movable feasts than traditional groups. They also happen to be responsible for some of the most engaging pop currently happening around the globe. 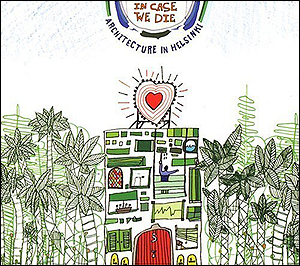 Formed in 2000, "In Case We Die," released in April, is AiH's sophomore effort after last year's "Fingers Crossed." From the opener, "Neverevereverdid," the band throws down a gauntlet: a tolling bell. The last time any Australian album made such conspicuous use of one was back in 1980 with AC/DC's multi-platinum seller, "Back in Black." By appropriating that bell back from hell, AiH are declaring some very big ambitions, indeed. Or a great flare for fun. By the time the musical saw and Volga Boat Song choir make an entrance, however, the sonic landscape bears zero resemblance to four-on-the-floor guitar rock. Within a four-minute song, AiH squeezes in everything from synthesizers and theremins to tubas and steel drums. All this while alternating tempos and arrangements with the deft speed of a swooping bat. Whether it's the scramble-tossed musical structures or the quietly disturbing lyrics, AiH commands attention. "Tiny Paintings," a pithy vignette with marimba, includes digital noodling bubbling up from under the mix like an R2-D2 droid conducting some kind of subversive jam. Sweet vocals and a cello buoy "Wishbone," but the lyrics about "chocking on a wishbone of love" suggest something else is afoot, something more akin to a violent upheaval. Lenny? Such is the skewed universe AiH inhabits, where gravestones can be transformed into calling cards. AiH's pedigree includes the feyness of Glasgow's Belle and Sebastian and the sonic collages of Brooklyn's The Fiery Furnaces, but the octet ultimately defies easy comparisons. They are clearly making music unlike anyone else. No need to shout; all we need to do is hop in and have some fun.